Granite State Market Match – You SNAP. We MATCH. 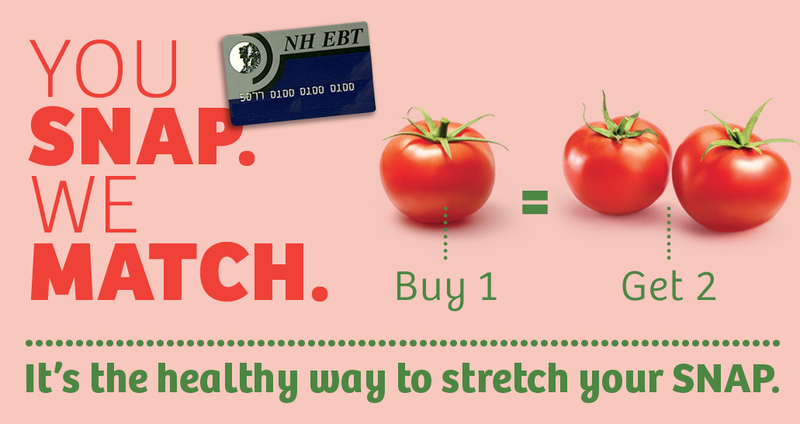 We double SNAP/EBT benefits for fruits and vegetables across New Hampshire. It’s easy! Find out how to stretch your SNAP/EBT and get more fruits and vegetables. Find the markets matching SNAP/EBT nearest you! Help us get fresh fruits and vegetables to families across New Hampshire! I was very pleased to use my EBT card for $10.00 and get $20.00 for fruit and vegetable incentives. I purchased some of that and held onto the rest to stretch it for the month. Thanks to you and the generous involvement from the community and farmers, I get to fuel my body with fresh veggies and eggs all week long, when I would have otherwise exhausted all my resources. Words cannot express how grateful I am for the matching grant funds to purchase fruits and vegetables for my family. Do you have a SNAP card?